Priced at $13.50, this "thinking putty" is not only fun to play with, but each blob is embedded with millions of tiny micron-sized magnets. That's not all, "it can still do all of the 'normal' things that you love about putty -- you can bounce it, stretch it, and tear it." 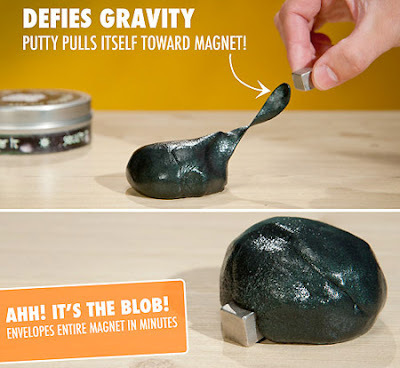 Holding the included neodymium iron boron magnet next to the Magnetic Thinking Putty will cause the putty to become magnetically charged. You can then pick up magnetized objects or even magnetize non-magnetic items.